Sen. Angus King told lawmakers Wednesday to "put your money where your mouth is" during a debate to add $600 million to a bill to combat heroin and prescription drug abuse. The Senate rejected the proposal. Senate Democrats on Wednesday lost a bid to add $600 million to a bill to combat heroin and prescription drug abuse, but said they won’t block the legislation over the funding fight. Democrats argued the extra spending is vital to ensure there would be enough money to put a real dent in the country’s growing substance abuse epidemic through new opioid abuse programs created by the bill. But party leaders shied away from trying to secure the spending by leveraging their ability to stall the legislation — a popular measure that addresses a crisis widely discussed on the presidential campaign trail. The amendment to add the spending failed on a 48 to 47 vote with 60 votes needed to overcome a point of order raised against the proposal. Five Republicans, including Sen. Susan Collins, joined Democrats in voting for the additional funds. Presidential candidates Marco Rubio, R-Florida, Ted Cruz, R-Texas, and Bernie Sanders I-Vermont, were not present for the vote. 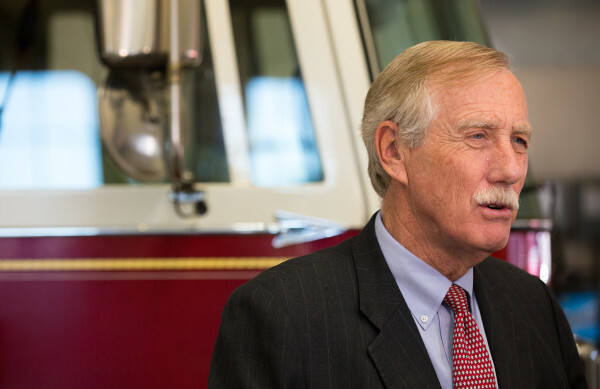 Sen. Angus King, I-Maine, criticized the Senate for rejecting the amendment, calling it “a missed opportunity.” The amendment, which was offered by Sen. Jeanne Shaheen, D-New Hampshire, and supported by King, would have appropriated money to support various grant programs authorized by the Comprehensive Addiction and Recovery Act, legislation currently under consideration by the Senate. CARA currently only authorizes – but does not appropriate – funding to fight the opioid and heroin epidemic. Without the appropriations provided under the Shaheen amendment, the legislation will have to move through the Senate’s appropriations process, which will consume vital time. King has long supported the push to appropriate emergency funds. In January, he joined Shaheen in York to announce his support for the measure, which would dedicate $600 million in immediate funding to law enforcement programs at the Department of Justice and treatment programs through the Department of Health and Human Services. In his remarks, King criticized the Senate for its willingness to approve billions of dollars in tax breaks at the end of 2015 without offsetting the costs while, today, rejecting a fraction of that money because it was not offset. Despite his frustration at the Senate’s failure to do more to address the problem, King intends to vote for the Comprehensive Addiction and Recovery Act. During consideration of the bill, King spoke from the Senate floor to share with the nation the heartbreaking story of Garrett Brown, a young man from central Maine who struggled with drug addiction. Garrett, whose story was recently chronicled by Erin Rhoda in the Bangor Daily News, long fought drug addiction before ultimately losing his life to a heroin overdose in November 2015. “It just seems ill-advised, to say the least, to appropriate more money when in fact there’s already $571 million available to deal with this epidemic,” Senate Majority Whip John Cornyn, R-Texas, said on Tuesday. The bill would set up new programs to provide treatment for opioid drug addiction and to reduce deaths from overdoses. The decision by Democratic leaders not to block the bill is a sign of how important addressing the nation’s worsening opioid abuse epidemic has become for many members of Congress. Democrats recently blocked progress on an energy bill due to an impasse over similar emergency funds to address the water crisis in Flint, Michigan. That dispute has kept the Senate from finishing up its work on the legislation. Concerns about opioid abuse have been on full display during the presidential campaign with candidates speaking candidly on the stump about family members who struggled with addiction. This was particularly true in the weeks ahead of the New Hampshire primary — a state where heroin addiction has become a problem. Passing opioid legislation swiftly is politically important for several lawmakers on both sides of the aisle. The drug abuse crisis has gripped political battleground states like New Hampshire and Ohio, where Democrats are hoping to make gains in Senate races. The Republican senators up for election in those states, Rob Portman, R-Ohio, and Kelly Ayotte, R-New Hampshire, voted in favor of the amendment to add $600 million. Lindsey Graham, R-South Carolina and Mark Kirk, R-Illinois, joined Collins in voting for the additional funding. A final vote on the legislation could happen as early as this week. The issue of the additional funding is unlikely to go away, as Democrats argue the drug crisis cannot be fully addressed without additional funds. Shaheen said after Wednesday’s vote that she would continue to fight “until we get the resources that families and communities need” to combat opioid abuse. She dismissed Cornyn’s argument that the year-end spending package enacted in December, the so-called omnibus, provides enough money to start funding the programs the bill would create. “The omnibus shouldn’t be used as an excuse for Congress to ignore the immediate need for resources in New Hampshire and across the country,” Shaheen said. Some Democrats also questioned the amount Cornyn said is available.